Jamaica is an island in the West Indies, 90 mi (145 km) south of Cuba and 100 mi (161 km) west of Haiti. The island is made up of coastal lowlands, a limestone plateau, and the Blue Mountains, a group of volcanic hills, in the east. Most major towns and cities are located on the coast. Chief towns and cities include the capital Kingston, Portmore, Spanish Town, Mandeville, Ocho Rios, Port Antonio, and Montego Bay. Jamaica is one of the most beautiful flight destinations in the Caribbean and is very popular year round. 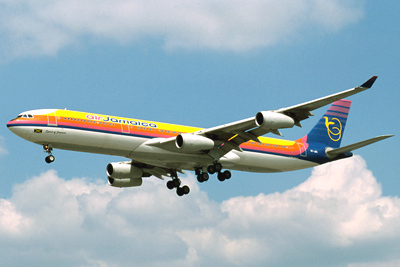 Visitors to Jamaica will fly into one of the two major airports; Kingston International Airport on the South coast and Montego Bay International Airport on the North West coast. Cruises Ship Tours in Ocho Rios Jamaica will likely include a visit to the beautiful Dunn's River Falls and a visit to nearby Dolphin Cove. Visitors will enjoy the flora and fauna that make this tropical paradise a truly unforgettable place. Then visit Dunns River Falls and enjoy the refreshing waters of this true wonder of nature. Drive through our lush Fern Gully Rainforest, stop off at the Botanical Gardens, then take a trip to one of the many shopping centers and craft markets. 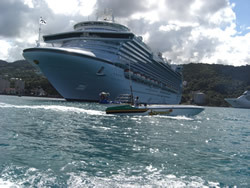 Cruises Ship Tours in Montego Bay Jamaica include visits to some of the impressive plantation great houses, Martha Brae Rafting, Montego Bay Duty Free shopping and a special visit to Bob Marley's birthplace in Nile Mile, Browns Town. Visit Rose Hall Great House 1760 is a restored plantation where legendary Annie Palmer lived. 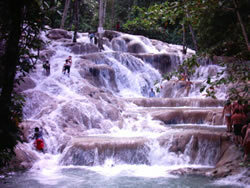 Dunn's River Falls is a world famous waterfall near Ocho Rios and is Jamaica's number #1 tourist attraction. Dunns River Falls located in Ocho Rios a few miles from the city center. The Dunns River Falls cascade over smooth lime stone rocks, through the tropical rain forest all the way to the white sandy beach below. You can climb up the water falls which are made up of limestone which tiers gradually allowing you to climb from the beach to the top, taking some of the most spectacular scenery along the way. Dunn's River Falls is one of Jamaica's national natural treasures. The beautiful white sandy beach at the bottom of the water falls was featured in James Bond film Dr No. The Dunns River Falls is also use as the back drop for many photo shoots, advertising and weddings. Jamaica has some of the best deep sea fishing that will satisfy any angler from beginner to season professional. 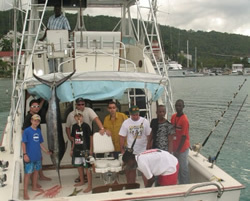 Jamaican deep sea fishing is extremely popular among tourist and locals alike. Jamaica sport fishing and deep sea fishing attracts a lot of sports fishermen from around the world, who go out fishing to land a big sports fish each year. You can charter one of the many deep sea fishing boats that we operate and go out for a half day or a full day deep sea fishing. Try landing one of the many deep sea fishing or sport fishing fish such as the blue marlin, white marlin, sailfish, mahi mahi, wahoo, bonita, green jack, jack fish, yellow jack, kingfish, tarpon, striped tuna, black fin tuna and yellow fin tuna. Scuba diving and scuba diving certification courses is relatively easy to learn under the supervision of a fully professional certified PADI Dive Master. The beginner program is a unique opportunity for you to start your scuba experience. Learn the basics of scuba by an experienced instructor who will help you to set your scuba equipment, ready for you to get started. 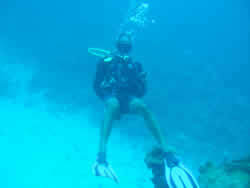 PADI Open Water Diver Course - your PADI Instructor takes you through the basics of learning how to scuba dive. You start in a pool or pool-like conditions and progress to the open water getting the background knowledge along the way. PADI Advanced Open Water Diver Course - gives you the opportunity to try some of diving's most rewarding and useful specialty activities, such as deep diving, digital underwater photography, wreck diving and much more. These skills make diving much more than underwater sightseeing.